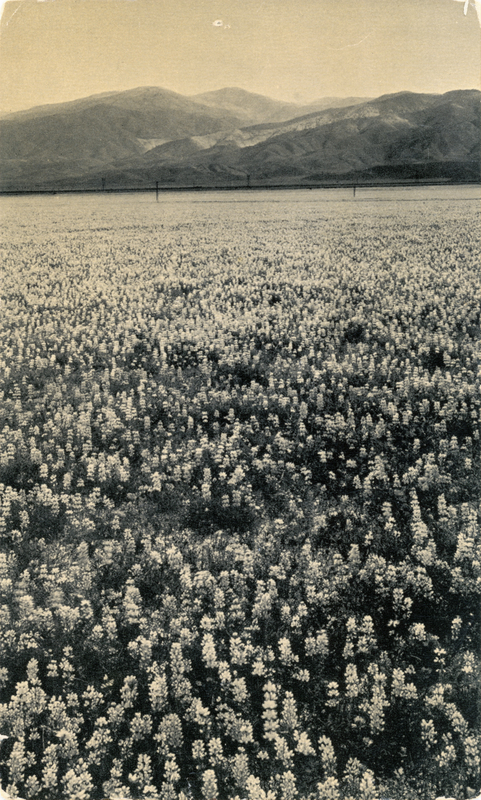 SCVHistory.com LW3218 | Mojave Desert | Wildflowers in Bloom, Standard Oil Advertising, 1930s. Wildflower viewing locations in the Mojave Desert (see below). 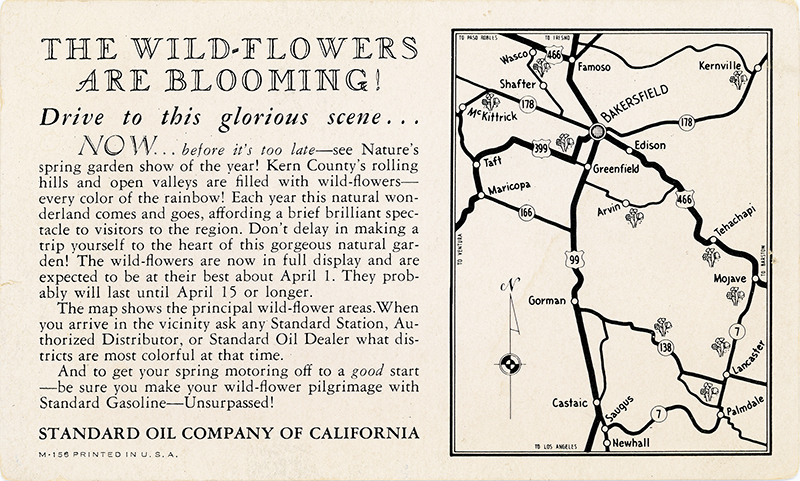 Undated postcard-size advertising card from Standard Oil Co. of California, encouraging a springtime motor tour with stops along the way at all the local Standard Stations. Lighter-weight stock than a standard souvenir postcard or RPPC. Map on back shows sections of Soledad Canyon Road and Sierra Highway as California State Route 7. According to SCV highway historian Mike Ballard, Sierra Highway, San Fernando Road (now called Newhall Avenue) and Soledad Canyon Road were signed SR-7 in 1934. They were resigned (federal) U.S. Highway 6 in 1937. It's likely this piece dates to that timeframe. NOW ... before it's too late — see Nature's spring garden show of the year! Kern County's rolling hills and open valleys are filled with wild-flowers — every color of the rainbow! Each year this natural wonderland comes and goes, affording a brief brilliant spectacle to visitors to the region. Don't delay in making a trip yourself to the heart of this gorgeous natural garden! The wild-flowers are now in full display and are expected to be at their best about April 1. They probably will last until April 15 or longer. The map shows the principal wild-flower areas. When you arrive in the vicinity ask any Standard Station, Authorized Distributor, or Standard Oil Dealer what districts are most colorful at that time. And to get your spring motoring off to a good start — be sure you make your wild-flower pilgrimage with Standard Gasoline — Unsurpassed! LW3218: 9600 dpi jpeg from original card purchased 2018 by Leon Worden.